(Bloomberg) -- The economic profession’s top brass will descend on Washington this week for the International Monetary Fund’s spring meetings, and they’ll have plenty of problems to chew over. Growth has been coming in soft across developed economies, and central banks don’t have as much ammunition to combat a recession, should it come, as they’ve historically enjoyed. Productivity gains are weak, and it’s not clear if or when it will pick back up. Brexit still looms large. But if Wall Street analysts and economic shops have it right, private and public-sector economists alike have room for optimism: The data in the world’s largest economy are coming back from the edge of the abyss. “The underlying condition of households appears strong, and we expect household spending to continue to support this expansion,” Seth Carpenter, chief U.S. economist at UBS Securities LLC, wrote in a note this week. 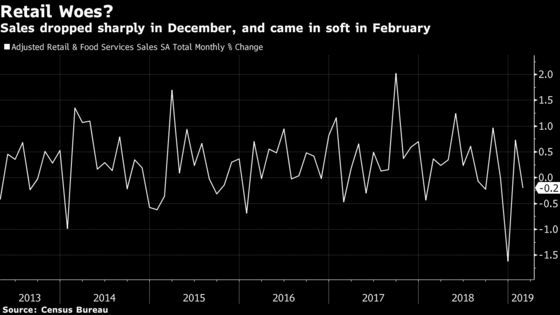 After weak retail sales at the end of 2018 that lasted into the start of this year -- weakness the team blames on tariffs and a drop in tax refunds -- a bounce in motor vehicle sales in March has increased UBS’ confidence that America will see further spending gains in coming months. Carpenter and crew aren’t alone in their high hopes. 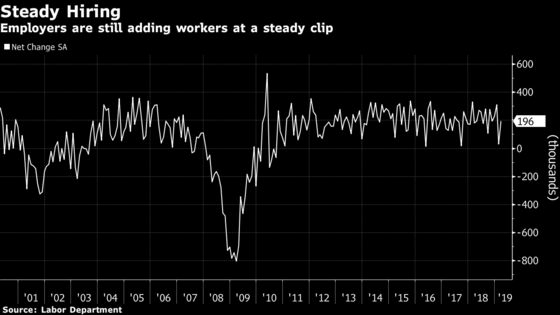 “Friday’s jobs report should put the remaining fears of a labor market stall to rest,” Goldman Sachs Group Inc. Chief Economist Jan Hatzius wrote in a note Monday titled "Past the Bottom." Employers added 196,000 jobs last month, a bounce-back after a paltry 33,000 in February. Hatzius noted that output growth is also starting to look better, and called the case for a pickup "simple": financial conditions were tight at the end of 2018 but have since eased, and China has been exporting positive economic news. “We don’t see the Fed signaling an easing bias anytime soon,” Michael Feroli at JPMorgan Chase & Co. wrote in a report early this month, pointing to improving prospects for growth. At the same time, the Federal Reserve isn’t expected to swoop back in with interest-rate hikes that might restrain the economy. Inflation is hovering below central bankers’ 2 percent goal, and they’ve signaled that they’re happy to be patient. If you’re worried about first-time homebuyers, you might want to check your data source. New York Fed analysts suggest that the bank’s Consumer Credit Panel might provide a better glimpse into the world of early home purchases than figures from regularly cited sources, including the National Association of Realtors’ annual survey. Their numbers show that while first-time buying did drop off sharply during the financial crisis and first-time buyer share remains below its level during the housing bubble, the data have recovered to levels similar to what the U.S. saw in the early 2000’s. Looking for someone to blame for falling labor share of income and increased market concentration? Try 1990s technological advances, based on this San Francisco Fed working paper. Thanks to information and communications-related progress, today’s big firms can lower their costs by spanning several product lines. The ones that do so efficiently cause a temporary surge in productivity, and would-be followers either don’t enter the market or end up innovating less. "Even the most efficient firms do less innovation eventually because they are more likely to compete with each other if they try to expand further," the authors write.